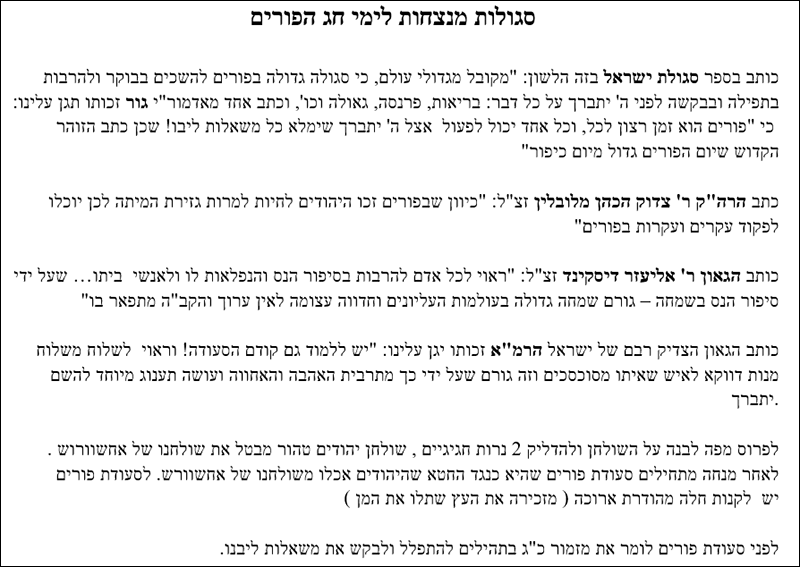 The Gaon and Righteous Rabbi of Israel the Rama (z”tl) wrote: “One should learn Torah prior to the Purim meal! And it is a worthy act to send Mishloach Manot specifically to someone whom you have had a disagreement with – and this creates a situation where love is multiplied and togetherness is established – and this causes a unique pleasure to Hashem Yitbarach. One should place a white tablecloth on the table that the Purim meal will be eaten and light 2 festive candles. The pure table of a Jew has the ability to cancel out the [wicked] table of Achashverosh. Following the Tefilah of Minchah one begins his Purim meal. This meal circumvents and atones the sin that the Jews were involved in when they attended Achashverosh’s party and ate from his table. It is virtuous to purchase a beautiful and long challah for the Purim meal (which reminds us of the tree that Haman was hung on). Prior to the Purim meal try and recite Chapter 23 of Tehilim and you can request all your heart’s desires.